Batting first, Lahore Qalandars are 83-5 at the end of 9 overs against Quetta Gladiators in the fifth match of the Pakistan Super League 2018 in Dubai. Brendon McCullum and Sunil Narine opened the batting for the Qalandars. Out for a duck in the opening game, McCullum was keen to make amends, going after the Gladiators bowlers early on. Narine wasn’t to be left behind as his plundered Shane Watson for 24 runs in the third over. The West Indian threw his bat at everything and paid the price in the 4th over when Rahat Ali had him caught. Here’s McCullum doing McCullum things. But after a brilliant start, the Qalandars, like they always do, lost their way a little; Fakhar Zaman departed. 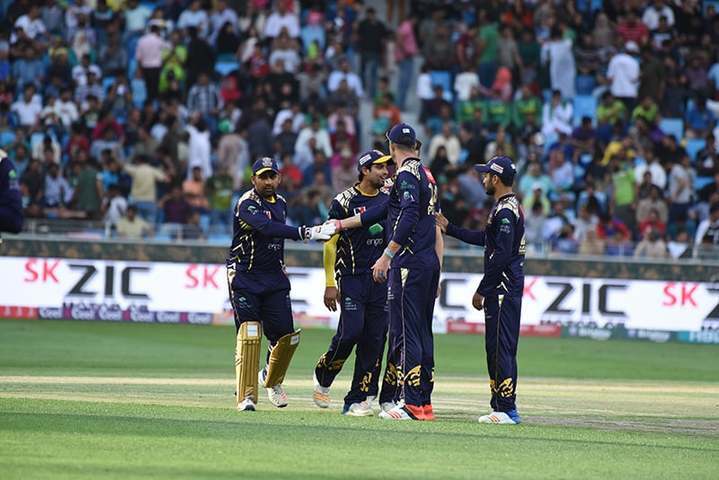 Quetta Gladiators: Asad Shafiq, Shane Watson, Umar Amin, Kevin Pietersen, Rile Rossouw, Sarfraz Ahmed (capt, wk), Mohammad Nawaz, Hasan Khan, Anwar Ali, Jofra Archer, Rahat Ali. Lahore Qalandars: Fakhar Zaman, Sunil Narine, Brendon McCullum (capt), Umar Akmal, Sohail Akhtar, Cameron Delport, Gulraiz Sadaf (wk), Yasir Shah, Raza Hasan, Shaheen Afridi, Mustafizur Rahman. Why does the U.S. women’s soccer team get paid less than the men?